For a year and a half now, NASA's Kepler space telescope has been staring, pretty much constantly, at a group of about 156,000 stars, located near the constellation Cygnus. In all that time, month in and month out, Kepler's digital eyes have barely blinked. But some of the stars have. Their light has dimmed a tiny bit, not just once, but over and over, in a regular, repeating pattern. And that's exactly what Kepler was designed to see  the clockwork signal of distant planets as they pass, once every orbit, between their parent stars and us. Kepler's ultimate goal is to find a twin, in both size and in distance from its star, of Earth  an orbital sweet spot known as a star's habitable zone. That's because astronomers assume these are likeliest places for alien life to have taken hold. The telescope hasn't quite done that yet, but the Kepler team has just announced a huge flock of candidate planets, pushing its total catch so far to more than 1,200. If they all indeed turn out to be planets, it will more than triple the number of known worlds orbiting distant stars  and that's just in a tiny patch of sky, and relatively close to Earth. "I expected Kepler would be finding a lot of planets," said Debra Fischer, a Yale astronomer who's not a part of the Kepler team, at a press conference. "But I'm amazed to see these milestone discoveries so quickly." 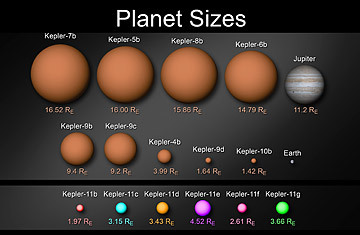 Fischer isn't just talking just about the impressive numbers, but also about how small some of the possible planets are. Last month, Kepler reported a world only about 40% larger than Earth  a very big deal since most of the planets identified have been Jupiter-scale worlds. But that's nothing: among the latest candidates are 68 worlds about the size of Earth, including a handful that are no bigger than Mars. Five of these, moreover, lie in the habitable zone. The other 49 planets Kepler found in habitable zones are bigger, but, as Kepler principal investigator Bill Borucki pointed out, "some are as big as Jupiter, which means their moons could have liquid water"  a crucial ingredient, biologists think, for life. "If there's life there, you could imagine the inhabitants going from one moon to another for vacation. Although," he added, "they probably wouldn't do it every day." Borucki, who was turned down by NASA four times before getting the go-ahead to build and launch Kepler, cautions that some of these new worlds might turn out not to be planets after all. Plenty of astronomical signals can look deceptively planet-like at first. They all have to be confirmed  ideally by measuring the object's mass with a second telescope. That's usually done by observing the slight wobble in the star caused by the tug of the orbiting planet's gravity. Only a handful of Kepler's planets have passed that test so far. In part that's because there's such a huge volume of data coming in from the space probe, and only a limited number of astronomers on the Kepler team who can do the followups. By releasing the candidates to the wider astronomical community, the team will be able to get these confirmations a lot faster  although with only four months' worth of Kepler's 18-months of data processed so far, the backlog may get bigger before it gets smaller. Still, it will be hard to beat an actual discovery announced today and published in the current Nature: Kepler has found not just one or two, but six planets orbiting a single star known as Kepler 11  an entire solar system, all in one shot. "The five inner planets," says Nature paper co-author Eric Ford, of the University of Florida, "are a few times as massive as Earth, all crammed in closer to the star than Mercury is to the Sun. It's remarkable  we never expected to see something like this." Says Jack Lissauer, a planetary theorist at NASA Ames Research Center and the lead author of the Nature study: "We suspected that the planetary zoo would have a great variety. But what that was, and how quickly we would find out about it, no way. This is way beyond anything we expected. Things like Kepler 11, these are just weird."